« Folia Archaeologica vol. 29 for Free! One-piece forged skull with lavish chasing and crown disc. Riveted peak on the front side with turned under edge and heavy, adjustable nasal as well as plume socket on the reverse side. Neck guard sliding on five lames, punched three-piece cheek-piece. Patinated surfaces, the skull with perforation corrosions. Height 31 cm. If you see something what is called “Polish hussars” or dated as Polish of 16th or 17th century, you should be double prudent. These objects are very often offered for a great deal of money, what always comes in pairs with a danger of a fraud. Original objects are quite rare, so their price is justified, but the rarity is accompanied with temptation to make replicas, that can make a lot of money. What should be remembered also, we know that in the 19th century a great amount of hussars-like object were recreated to decorate interiors or to serve as a part of masquerades or historical reconstructions (like in 1883 for the Vienna battle anniversary). It is very easy to get fooled by them! 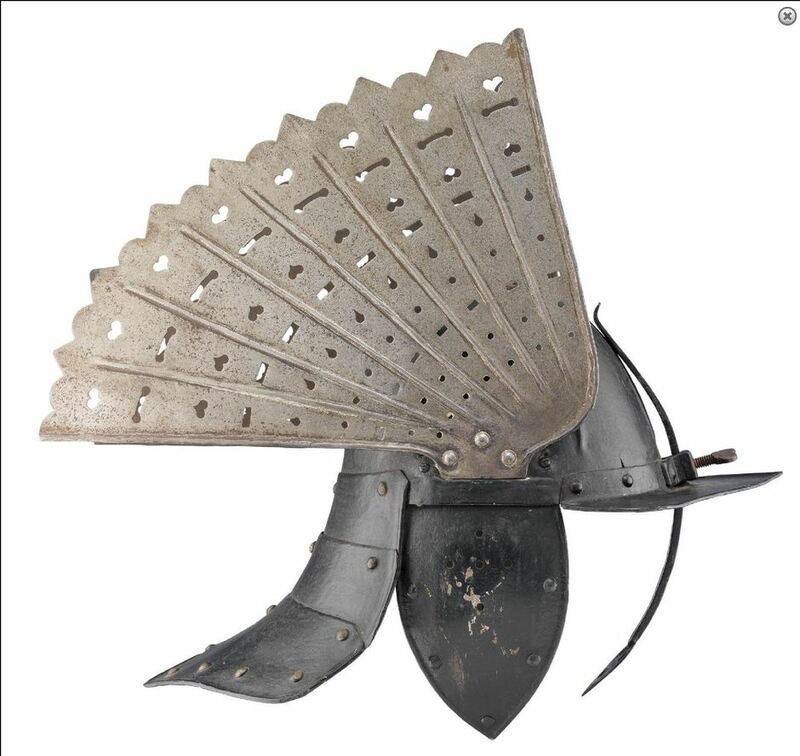 This lobster-tailed helmet was lately offered by Hermann Historica. Judging by pictures it is difficult to be precise, also giving the fact of lack of many other information, like full set of dimensions for example, doesn’t help either. But the alarm bell is ringing seeing only height of the helmet in the auction description. Why only this dimension? Where is weight or diameter, which would help to judge this object better! Without this information saying whether this object is original is impossible but there are some features that would make me think twice. First thing that comes to mind watching this “burgonet” (and actually it should be called kettle-hat – kapalin in Polish) is its clumsiness. Especially the neck-guard is very strange, protruding strongly into the back with this strange angle, which we cannot see in other examples of hussars helmets. Well, almost. Those made in the 16th century had often wide rim, to which neckguard attached had to be under different angle, then in classical helmets. Here it is either pointless or made for hunchbacked soldier. 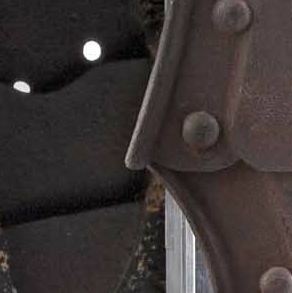 Also these holes under the rivets are suspicious. 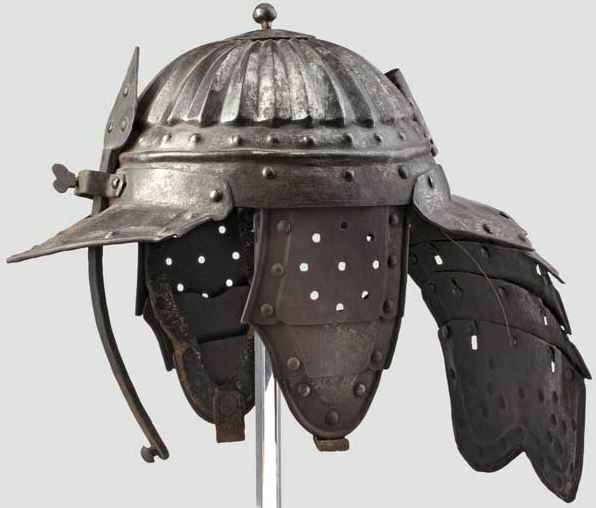 No other hussar helmet known to me had such. Apparently someone who made this helmet wanted to have the tails moving, no realizing the fact that is not a common feature for other helmets of that type. 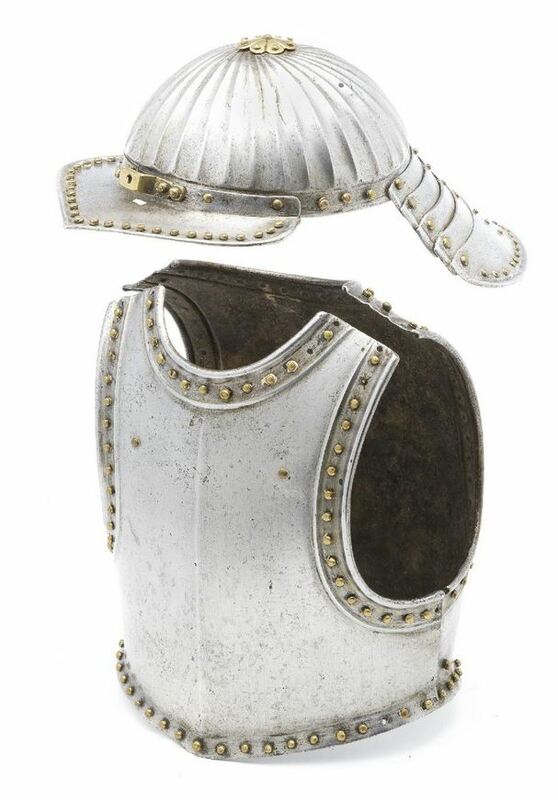 Other thing that doesn’t really fit to the standards of hussars helmets are cheek-pieces made of three parts. 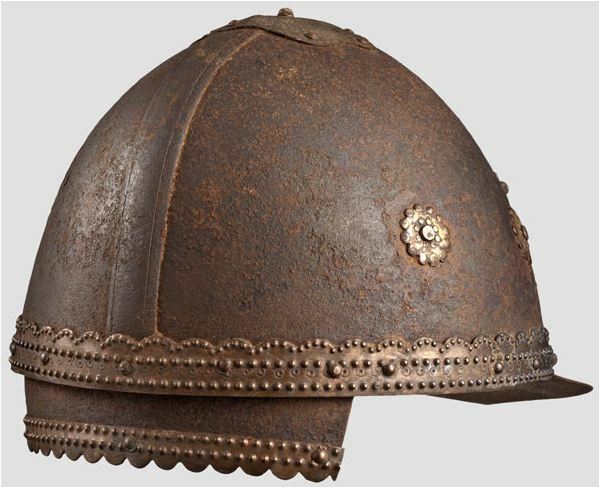 Usually soldier wanted to keep that piece as simple as possible, and rarely hussars helmets are constructed that way. It is not only awkwardly looking, but also an unnecesarry complication. If the cheek-piece is made of many elements like it is seen in European helmets, then all the parts should be matching better. 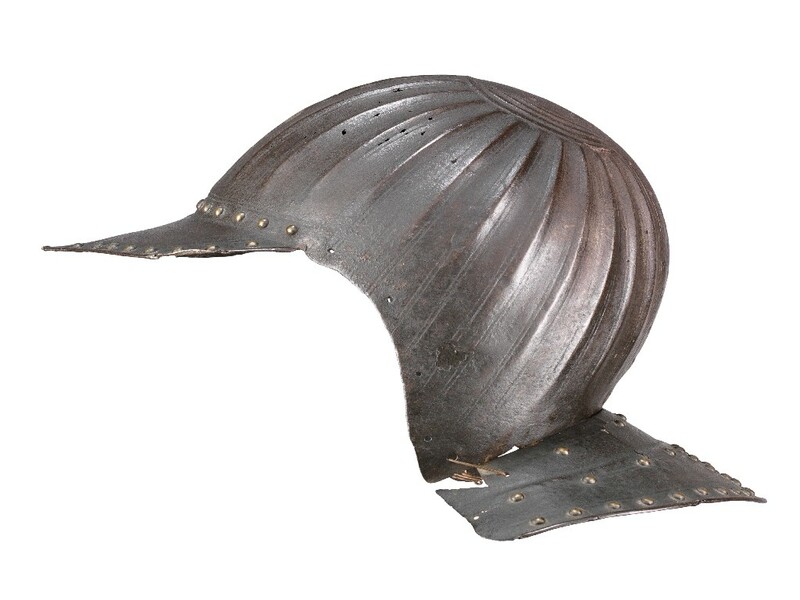 Also dating of this object seems to be wrong, as all Polish kettle-hats of this type are dated circa 1600 rather then 2nd half of the 17th c.
If somebody would asked me, I would judge this object as a 19th century helmet, “Victorian” in style or compiled of original and reconstructed parts. 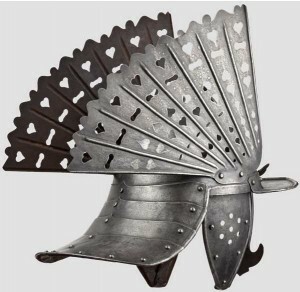 But on the other side one has to remember that many hussar armour pieces was made individually, and some untypical examples may exist and force us to wonder…. One-piece skull embossed with six ridges and riveted visor, adjustable nasal bar and neck-guard of four lames. On the sides, two riveted heart-shaped wings embellished with geometric openwork. Attached cheek-pieces pierced with seven holes each (leather strap of the cheek-pieces an later addition). Height ca. 39 cm. In contrast with the previous helmet, this one looks really fine. But this is also a standard “pappenheimer” type of helmet, used in many Central-European countries, including Poland and Germany. 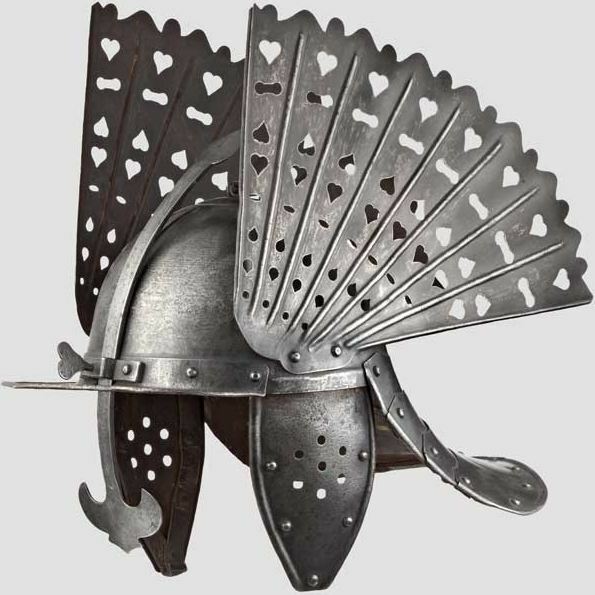 The distinguished wings on the sides of the helmet might indicate its Polish provenance, but it could be also for a Saxony, which was united with Poland since the Fridrich August I, Saxon elector was introduced into Polish throne as August II in 1697. That’s why the price at which this helmet was sold (7.200€ which is 10.300$) is shocking high and hard to explain only by the pictures and scarce description. From a John Woodman Higgins Collection. Perfect example of what was written above. Would you recognize it as 20th century forgery? At least from the picture it seems to be very tricky. Of course there is one thing at least that should alert a potential buyer (fortunatelly the Auction House was very honest, but will next one be? ): the wings are not blackened in contrast to the rest of the helmet, what gives an assumption that they are later addendum. Another good example of how easily one can be confused by so-called “Polish” objects. Compare this beautiful helmet with the first one on this page, from Hermann Historica auction, which I thought to be a 19th century forgery. This one was easier to recognize thanks to the cuirass, which is clearly of later origin and bears the same style and riveting as helmet. 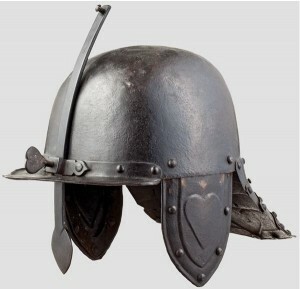 But sold separatly as a potential 17th century Polish hussars helmet, this one could reach a price of 2500€. 2nd half of 17th century. One-piece skull, a reinforcing band applied to the crown. Blossom-shaped crown plate of embossed brass. Riveted, pointed peak with opening for the missing nasal bar. Riveted to either side three brass rosettes, embossed ornamental band around the perimeter. The one remaining lame of the neck-guard featuring an applied decorative brass stripe. Cheek-pieces and the other neck-guard lames missing. 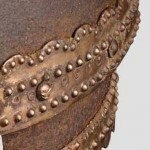 Metal surfaces with rust patina. Height 17 cm. This is excellent example of how much hussars armours and militaria are desired amongst some of the collectors. One would wonder how much you can pay for a rusted, damaged and incomplete helmet. To soften description there is even a term used “rust patina”, what sounds a lot better then simple “rusted wreck”. But there seems to be no doubt that this are the remnants of original Polish hussars zischagge, with so characteristic brass strip and rosettes. Unfortunatelly that is only a skull with visor and one tasset of the neck-guard. Nasal, cheek-pieces are missing. Why would somebody buy it for such a price? 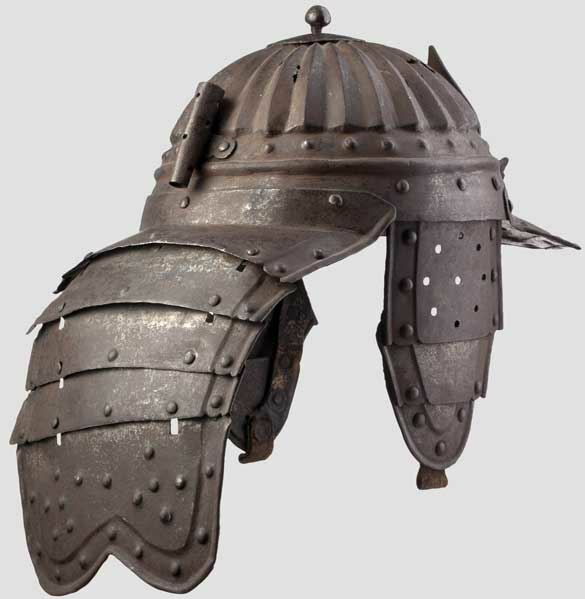 After cleaning rust and complement the helmet with missing parts (whether from another incomplete example or from newly made pieces) will double the price of this zischagge without a doubt. Caveat emptor! Two-piece, blackened helmet skull with riveted, turned peak and adjustable nasal bar. Neck guard sliding on three lames. The attached cheek pieces, peak and neck guard with heart-shaped decoration. Minor repair and two replaced rivets on the neck guard. Height 25 cm. Simple but interesting example of zischagge, that might be Hungarian or Polish. But if this is its actual origin is another question to raise. It is worth to look into German and Austrian armaments too. Sold for 750£ in 2011. Very unusual helmet, interesting in shape. The scull of this helmet doesn’t remind any other Polish helmet of this period. They were usually semicircular, while this one additionaly is widened at the rear, covering back of the head. Shame there are no cheek-pieces, they could be another hint to place this helmet in time and place. The shape of the scull reminds strongly those late renaissance European helmets, modeled after ancient patterns.